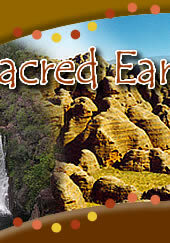 Kakadu Tours & Kimberley Safaris with Sacred Earth Safaris :: 4WD Kakadu Tours, Kimberley Tours & private charters. 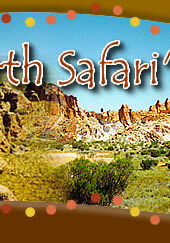 Sacred Earth Safaris are a small, family owned and operated Northern Territory tour company, based in Darwin. We specialise in small group 4WD Kakadu tours, 4WD Kimberley tours, Pilbara 4WD Tours, Uluru and Red Centre 4WD Tours, Outback South Australia 4WD tours, Nullarbor Tours and personalised private tours through the Northern Territory, Western Australia, South Australia and Tasmania. We pride ourselves on our personalized service and attention to detail. 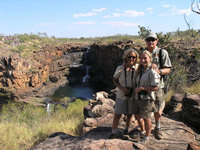 With almost 40 years combined touring experience, relax in the knowledge that we will do all we can to ensure you have an enjoyable, fun, interesting and memorable holiday to these unique and special parts of Australia. Kakadu and the Kimberley are the last frontiers of Australia with ancie nt landscapes, spectacular waterfalls, pristine rock pools and magnificent gorges. Whatever your interests are - there’s something for everyone in our tours : Waterfalls, ancient Aboriginal rock art, bird watching, swimming, hiking, an abundance of wildlife or you can simply immerse yourself in the environment, relax and soak up your surrounds. With a maximum 15 passengers for scheduled Kimberley touring and with 3 vehicles to choose from for private touring to Kakadu and private tours to the Kimberley, ranging from maximum 4 in our luxury 4WD, to maximum 24 in our Tatra 4WD coach, we can cater for micro, small and medium sized groups. Our small group tours allow plenty of time to experience the sights, for individual interests to be pursued, there's flexibility in our itineraries and you receive more individual attention from your guide. This gives you a more personal experience and you ONLY get this on a genuine small group tour. Our luxury 4WD Range Rover Vogue, comfortable off-road 4WD OKA expedition vehicle and Tatra 4WD tour coach, provide maximum comfort in the rugged outback and allow us to take you to more remote locations, far from the crowds, to truly experience the area. Take one of our scheduled Kimberley safaris or let us design a private charter programme to suit you. Our scheduled Kimberley 4WD tour and scheduled Kakadu tours have been designed to cater for all interests and visit all the best places through these regions, in comfort and style. Fully- accommodated, we stay in fixed safari tents, en-suite cabins and station accommodation. 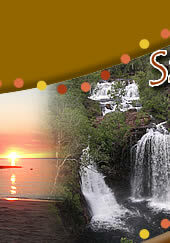 Private charter itineraries are specially designed to suit your interests and time frame. We can tailor-make programmes for specialist bird watching and photographic groups, social clubs, incentives and of course, families and groups of friends, who want a more personal experience in this special part of the world. Swimming in crystal clear rock pools and under waterfalls, cruising through vast wetlands, visiting ancient Aboriginal rock art sites and experiencing Aboriginal culture – there’s so much beauty and so much to do - let us introduce you to the Kimberley and Kakadu in all their splendour. During spring and autumn (Oct - April) we offer scheduled and private touring across the Nullarbor, to Kangaroo Island, the Fleurieu Peninsula and through Outback South Australia including Coober Pedy, Lake Eyre, Innamincka, Marree, Arkaroola, the Flinders Ranges and along the Oodnadatta Track, Birdsville Track and S trezelecki Track. Tours include accommodation, entry fees and activities and our small group Kangaroo Island tours include return ferry fare as well. We will pick you up and drop you off at your accommodation, taking care of everything in between so you can relax and enjoy your holiday. South Australia is abundant with wildlife, is rich in heritage and offers a large range of local produce as well as many adventure activities. We can tailor-make sightseeing tours as well as wildlife experiences, adventure tours, photography tours and food & wine experiences, catering for individuals, families, groups of friends or incentive groups.